Winter Landscape (Winterlandschaft) forms part of German artist Anselm Kiefer's major retrospective at the Royal Academy of Arts, London (27 September - 14 December 2014). 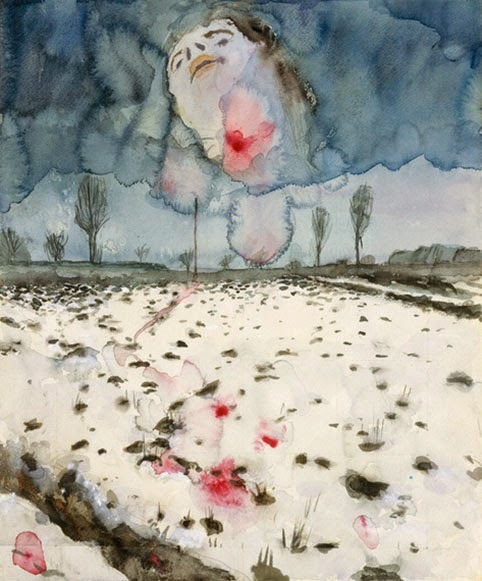 Addressing Germany's horrific Nazi past, the piece features a disembodied woman's head rising above a snow-covered field. Blood from her neck stains both the sky and the barren soil. As such, a spiritual and quasi-mythological dimension is added to the bleakness of war.